There is a six-year age gap between my youngest sister and me. As children, we fought constantly, which perpetually baffled my mother. Over time, we did develop some similar interests, including a fondness for terrible action movies, raw cookie dough, and pop music, but that age gap still lingered. When I moved out of the house, my sister was 12. Sure, we saw each other on the holidays, but a large part of our relationship centered on texts or phone calls. Eventually, it was her turn to leave the house and go off to college. Four years later, in the months leading up to her graduation, she mentioned how she wasn’t sure what to do after college. I invited her to live with me for the summer, hoping it would give her a few restful months to think about her next steps, while also allowing me the chance to get to know her better. She accepted and arrived at my house with a suitcase, a backpack, and not much else. Truthfully, we were both a little nervous having not lived together for nearly 10 years. We went from never having shared much to sharing everything—a room, a car, a job, and our weekends. During the week, we worked at the same nonprofit—she helped coordinate summer camps and I handled marketing—but we reserved the weekends for hikes. For my entire life, I’ve loved the outdoors. Summers were spent outside, speeding through the arboretum on my bike and playing capture the flag with neighbors in a nearby woods. I’d go camping with my dad and come home with snarled hair and thousands of mosquito bites. When I left for college, I got into hiking, taking off with friends on dirt trails and up mountains. Growing up, it sometimes felt like I had too much energy. I struggled to concentrate in church and in school. The outside didn’t require me to sit still, though. Hiking let both my feet and mind wander, and allowed me time to reflect on anything I wanted to—relationships with friends, future goals, and my belief in God. My sister, however, felt rather indifferent about the outdoors for most of her life. Then, shortly before she came to live with me, a switch flipped. She’d spent a few months working on a guest ranch and found herself taking long hikes. Suddenly, she couldn’t get enough. Western Montana has no shortage of trails. The week my sister arrived, we sat down and made a list of the ones we hoped to hike. We searched for trails we’d never heard of, then piled into our car, windows down and music blasting, and wound up dirt roads with sharp turns and even sharper drop-offs. We hiked fast, and we hiked loudly, shouting to one another about the latest celebrity gossip and throwing out new song ideas for our ever-growing weekend playlist. We crossed paths with moose, marmots, and mountain goats, giving our new friends wide berth whenever we stumbled across their trails. At vantage points we’d stop to catch our breath, whistle at the views, and chew on granola bars. Once at our destinations—lakes, viewpoints, and summits—we’d lay on our backs, soaking up sun and slapping mosquitoes. Our hikes served as meditation, giving us a few hours each weekend to hit reset before Monday rolled back around. As our feet kicked up dirt, work stress trickled away, and in its place, slipped a sense of calm. Fires rolled in before we could complete our hiking list, and we spent several weekends at home, moping indoors as smoke filled the valley. In late August, we became fed up with the smoke, tossed our packs in the car, and hightailed it to the Tetons for a weekend hiking getaway. It was in the Tetons, as we celebrated the end of our summer with an overnight backpacking trip, that it became clear how much closer we’d become—both as sisters and as friends. Thanks to those weekends of long hikes, good conversation, and plenty of laughs, we had filled in some of the gaps from the last 10 years. 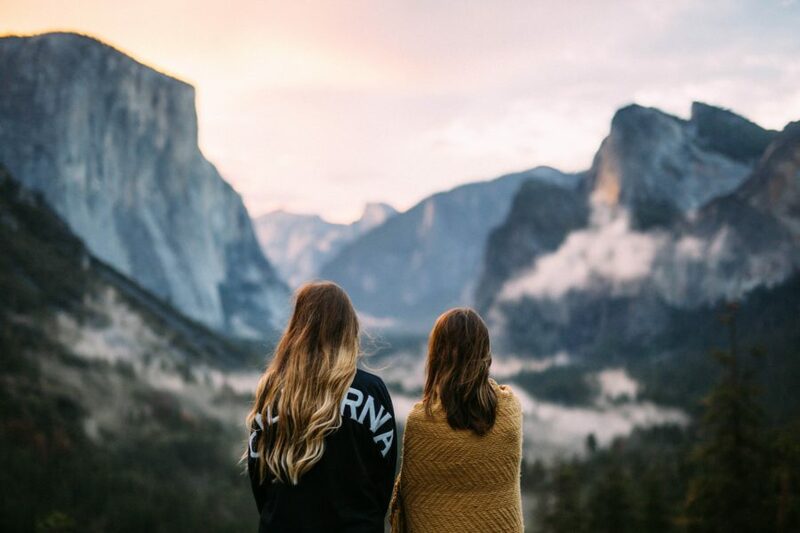 That summer, my sister and I embraced both the mountain-filled landscapes and the opportunity to get to know one another better. Hiking meant leaving our phones, music, and internet behind and focusing entirely on what was in front of us. It allowed us to pause during busy work weeks to enjoy each other’s company. My sister and I are already busily planning next summer’s list with a bunch of new-to-us hikes, as well as a few old favorites mixed in. We anticipate blue skies, great views, and maybe a marmot or two. One thing’s for certain though: The company can’t be beat.